I tend to watch films in move theaters when I think they’ll have a particularly significant impact, will be worth remembering years from now and, of course, when I’m lured in by the story. 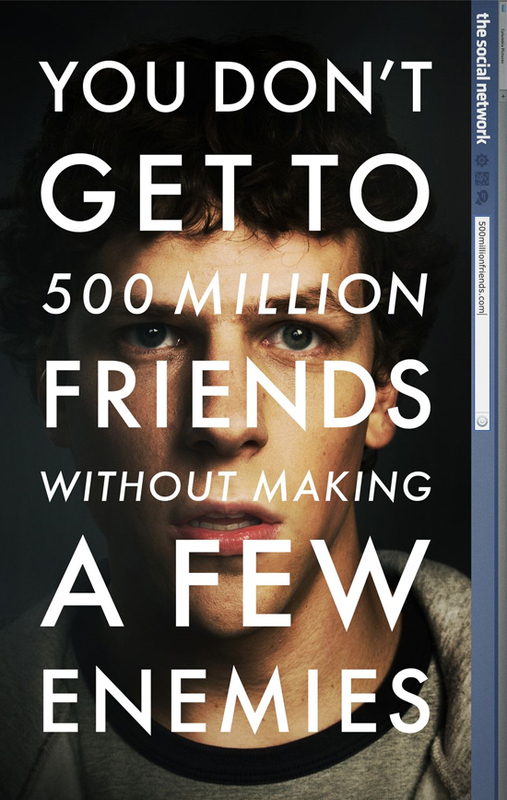 The Social Network, Aaron Sorkin’s film that tells with some literary license of the meteoric first-year rise of Facebook, fit the bill. Last week, I saw and was greatly entertained — call it a 9 out of 10, not perfect but sure close and worth the price of admission. The story is compelling and it is grounded enough in fact to give it a weight of impact. While not as much as I suspect might be fair, the movie does a commendable job of creating complex leading characters, in which the antagonists don’t need to be villains, but are nearer to complexly motivated individuals with whom the audience can identify. It even reminded me of the Wire in serving like almost a diary through which we look at, in historical terms, incredibly recent events. But you know of the movie, and I have no interest in spoiling the plot for anyone who hasn’t seen it — or read the book on which it is based, so I wanted to share some of the more interesting take aways I’ve had in reading discussion around the movie. It’s said there are child prodigies in only three areas: math, music and chess. These non-verbal areas require little maturity or knowledge of human nature, but a quick ability to perceive patterns, logical rules and linkages. I suspect computer programming may be a fourth area. Also worth reading is writer Aaron Sorkin defending the portrayal of women in the film, Mashable’s short piece trying to get Zuckerberg’s take on the film and, hell, why not Sorkin’s interview with my friends at Geekadelphia, in addition to one with Jesse Eisenberg who played Zuckerberg. The battle that is often reported to have happened around the founding and launching of Facebook — as prominently displayed in the film — is perhaps inevitable. There was too much money and potential involved. But it still left me wrestling with the value of launching a venture with multiple people in equal partnership. Decisions may be slowed and, as growth continues, that, say, three-person team may be untenable, but in an organization’s early growth, having the checks and balances in direction can be powerful. It’s a movie worth seeing for all of these reasons and, probably, more.